Engines will drive boats ten or twelve miles per hour, and there will be many hundred steamboats running on the Mississippi. I have no doubt but that my engines will propel boats against the current of the Mississippi, and wagons on turnpike roads, with great profit. Address to Lancaster turnpike company (25 Sep 1804). As cited in 'On the Origin of Steam Boats and Steam Wagons', Thomas Cooper (ed. ), The Emporium of Arts and Sciences (Feb 1814), 2, No. 2, 213. 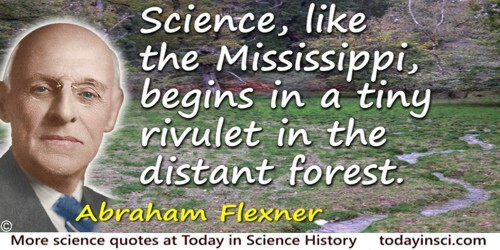 Science, like the Mississippi, begins in a tiny rivulet in the distant forest. In 'The Usefulness of Useless Knowledge', Harper’s (Jun/Nov 1939), No. 179, 549. Part of a longer quote beginning, “One must be wary in attributing scientific discovery…”, on the Abraham Flexner Quotes page of this website.